Aqualand Water Park is the perfect place to cool off while holidaying on Corfu. 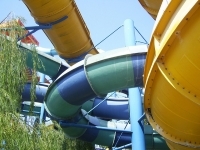 With its wide variety of slides, rides and pools, it's understandably one of the island's most popular attractions for kids and adults alike. Children aged four to eight can enjoy water games, slides, jumping castles, playgrounds and more in a fun-filled kid's area. Thrill seekers will find steep, scary slides. Visitors looking to relax should head for Jacuzzis, gentle pools, the Lazy River and sun loungers. Parking, sunbeds, umbrellas, as well as access to shower facilities and changing areas are all free. Dining options include a bar, a restaurant and various fast-food kiosks. Visitors should pack plenty of sunscreen as the park is very much exposed to the glorious Greek sun.